For a hacker, there are pool of ways to hack your financial credentials. It’s like a shopping bucket for robbing your money! While online cyber crime has increased in past few years, one cannot ignore the fact that at ATMs as well the number is rising at a consistent speed. There are many ways to wipe out your money from ATM, but one of the most difficult is skimming. To be honest, ATM fraud skimming are very easily identified, but very few notice this scam while removing the money. Majority of customers, just generally use their debit card, almost anywhere they find an ATM without paying attention to that machine. Yes you have read it right, ATMs actually can wipe your money, without even hacking your debit cards. This is a method adopted by a criminal for capturing your data through your magnetic stripe which is situated at the back of your debit card. There are two ways of in this skimming. Firstly, there is a device called skimmer which is placed on the face of an operation ATM. So what happens is when, you place your debit card in the section of an ATM, the skimmer gets on and starts to record your data on the card. To your surprise, there is a camera hidden in that brochure holder or security mirror, these are almost unrecognizable. The camera operates like a scan of a xerox machine. Secondly, skimming takes place when a used ATM is placed in public location. Usually, these used ATMs are semi-operational and were sold because of ineffective cash dispense. Any fraudster, can purchase these ATMs easily at second hand market at bargaining price, and place it in crowded area. Know how your debit card is in danger! This the front of a debit card which involves information like card number, your name, the bank name, expiry date and the card type (example Visa, Master, etc.). While these are still fine, it is the back of your debit card which is in danger. At the back, there is a black bold plastic like ink on your debit card – that is called as Magnetic Strip. These strip are iron-based and are very tiny magnet about 20 millionths of an inch long. Now the gem of magnetic strip is that, they contain data like your card name, card holder name, card number, date of expiry and loyalty programs. 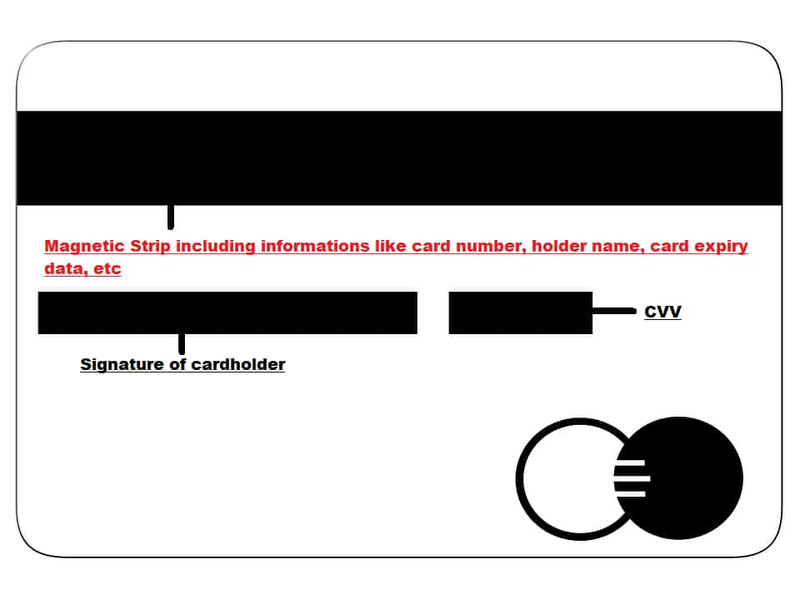 The next big thing is the CVV number and your signature at the back. ATMs can read magstripe debit cards, hence, when there is skimming involved it is very easy for fraudsters to penetrate your bank account. For your information, RBI has been asking all magstripe cards to be replaced with EMV chips, and many banks including SBI has followed this measure. One can identify their debit card as an EMV chip, if there is a chip located on the face (center left position) of the card.If there is no chip, this means your card is still magstripe. EMV chips are used by banks globally for customers debit card, as it involves microprocessor chip that store and protect cardholder data. This is a much secure technology as compared to Magstripe variants of Card. ATMs also accept this card with chips. Hence, shift your debit card to an EMV chip. Either you are using your bank branch ATM or anywhere located at restaurants, gas stations, etc. before putting your debit card examine the machine. If the machine does not match to the normal ones, that means it might be a skimmer. You must shake the card scanner to check if something is attached with the card reader of the ATM. To remain safe at best, is to use ATM which are located with your bank or bank branch. Also, make sure the ATM is manned by security guards for 24X7. This reduces the possibilities of skimming, as one will be deducted soon enough. Check, that your ATM is well equipped with proper ACs and camera system. Avoid ATMs at isolated areas! Need of cash can be anytime and anywhere. However, in hurry do not make a mistake of using an ATM with poor service and at isolated places, dimly lit locations or streets. This increases the chances for fraudsters to add the skimmers. Also, do not use ATMs where the card reader is not in good condition. For instance, if they are tampered broken, scratched, damaged or sticky, then avoid it as the wiring must be loose which can involve skimmers. RBI explains, the card holder should be vigilant and check if any extra device/s is / are attached to the ATMs . The device/s may be put in place to capture customer data fraudulently; if found, the security guard / bank entity should be informed immediately. Make sure no one is reading your PIN! RBI has directed multiple times, to not let anyone read your four-digit PIN number of your debit card, as they are very important tool for removing money. Hence, if you are at an ATM, make sure you go alone and if not then do not let anyone read your PIN. Cover your hands and type your PIN. According to RBI guidelines, a cardholder must keep an eye on suspicious movement/s of people around the ATMs. He / She should be careful of strangers trying to engaging him / her in conversation or offering assistance / help in operating the ATM. Do not leave your card! Majority of banks allow you to remove your debit card, in just few seconds you have inserted the card. However, most of private banks and few PSBs hold the card in ATM card reader until the transaction is completed. Hence, check these ATMs properly. Also once transaction done, do not leave your debit card in the ATM even for a phone call. Check your debit card statement! On every alternate days, check your debit card statements. You can either visit the bank, they update your passbook which records information of every detailed transactions. Or else you can do it online via your bank’s net banking service or even mobile apps. Do not keep a password which is easily guessed, even for your four-digit PIN. Hence, make sure the ATM you are using is safe and secured to use. Or else, you will lose your money in simple errors. Even if you have fallen in such trap, you can always complaint your bank, they are open 24X7 for complaints and queries. However, even if you file a complaint, the reality is not all of your money will be recovered, therefore, be alert in advance.